Sat, Mar 23, 2019, 10:20 am SL Time, ColomboPage News Desk, Sri Lanka. 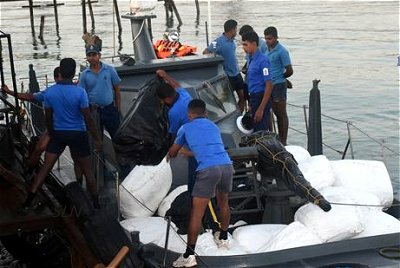 Mar 23, Colombo: Sri Lanka Navy during a search operation in the sea has arrested three individuals in the possession of over 1500 kilograms of illegally smuggled beedi leaves. A group of navy personnel attached to the North Central Naval Command, during a patrol carried out in Talaimannar sea area on Friday arrested the three individuals with 41 sacks of Beedi leaves. Navy personnel recovered 1547.68 kg of Beedi leaves during the search and suspects that the consignment is a smuggling attempt from India by a dinghy. The suspects who are in the ages of 28, 30 and 35, are residents of Urumalai area in Thalaimannar. The haul of Beedi leaves along with the suspects will be handed over to Customs office in Jaffna for further investigations. Further, 2787.3 kg of Beedi leaves have been seized by the patrols and raids carried out by the Navy during the past few days and the process for curbing smuggling attempts is continued.